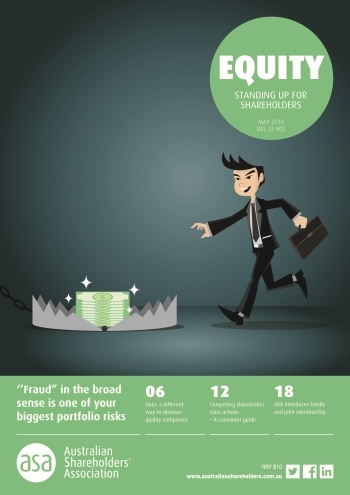 ASA membership includes our specialised monthly members’ magazine EQUITY - online or in print. This popular highly-regarded magazine helps members stay informed and build financial knowledge through current, topical and expert articles about investing, corporate governance and the share market. Fraud is more common than many realise, can be present at any stage of a market cycle, often leads to total loss (unlike crashes which eventually recover) and may particularly impact less experienced DIY investors. Having trouble viewing EQUITY? Call the ASA National Office on 1300 368 448.